Each week, we will post a question about the week’s episode. We invite you to submit answers at sciencematters.gatech.edu, until Friday noon of the same week. We will choose a winner randomly from all correct entries. We will announce and notify the lucky winner on the following Monday. Winners will receive our exclusive ScienceMatters pen and sticky note pad. Questions will be posted on Mondays on the College of Sciences’ Facebook page (@GTSciences) and Twitter feed (@GT_Sciences) and at sciencematters.gatech.edu. Georgia Tech is well known for engineering and computing; but Tech is also very much about curiosity-driven discovery in the sciences and mathematics. ScienceMatters goes behind the scenes of that type of research on campus. Because wherever we turn in the physical world, science matters. Season 1 features nine of the College of Sciences’ award-winning faculty and one of its enterprising postdoctoral researchers. School of Psychology Professor Bruce Walker, director of the Sonification Lab, describes his work with AT&T on the eclipse soundtrack and beyond. Walker’s team is not only giving a voice to data, but also studying how people interact with voice- and audio-interfaced technologies, such as self-driving cars. Jenny McGuire, an assistant professor in the School of Earth and Atmospheric Sciences and the School of Biological Sciences, has a tough commute to her summer research site: An 80-foot drop into Wyoming’s deep, dark Natural Trap Cave. There she collects fossils that she hopes will yield clues about the impact of climate change on animal and human populations. Leishmaniasis is a scary parasitic disease; it can rot flesh. Formerly restricted to countries near the equator, it has arrived in North America. School of Chemistry and Biochemistry Professor and Chair M.G. Finn explains why it’s so tough to fight this disease. His collaboration with a Brazilian researcher has raised hopes for a possible vaccine. In the Georgia Aquarium, massive whale sharks headline the Ocean Voyager exhibit. But it is the tiniest residents that concern Nastassia Patin. A postdoctoral researcher in the School of Biological Sciences, Patin studied the exhibit’s microbiome. What she learned may help keep the water in all aquariums clear and healthy for all its inhabitants. Possible scenarios for the birth of stars, galaxies, and black holes come alive in the data crunching and visualizations of John Wise, a professor in the School of Physics. Wise explains how his simulations and visualizations – some of which have won awards –help researchers “rewind” space and time back to the origins of the universe. Simon Sponberg mashes up physics and biology through his work on the physics of living systems. With joint appointment in the School of Physics and the School of Biological Sciences, Sponberg studies how animals move through their environments. Among his unusual research methods is placing moths on joysticks so they can “play” video games in virtual reality. By day, she’s Jennifer Leavey, senior academic professional in the School of Biological Sciences. When she hits the stage and plugs in her guitar – Surprise! She morphs into Leucine Zipper, leader of the rock band Zinc Fingers. For a change of pace, ScienceMatters samples the band’s science-inspired songs. Leavey shares how the band uses music and other media to teach science. How exactly does aging affect our memory? What is “memory clutter”? Can we make it go away? Audrey Duarte, an associate professor in the School of Psychology, uses magnetic resonance imaging and special tests in her Memory and Aging Lab to discover what causes obstacles in the brain’s pathways as people age. “The enemy is cancer,” says Mostafa El-Sayed in the Season 1 finale. El Sayed – Regents Professor and Julius Brown Chair in the School of Chemistry and Biochemistry – is working on a promising cancer treatment based on gold nanoparticles. His work is inspired by, and dedicated to, his late wife, who died from the disease. 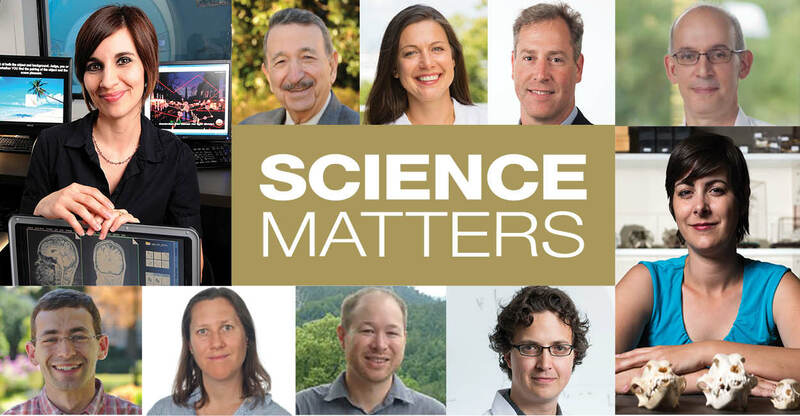 ScienceMatters is a production of the College of Sciences’ communications staff. Siyan Zhou, formerly a researcher in the Sonification Lab, composed the original theme music. Renay San Miguel – former anchor and reporter at CNN, Headline News, and CNBC – is the podcast’s producer and principal host.